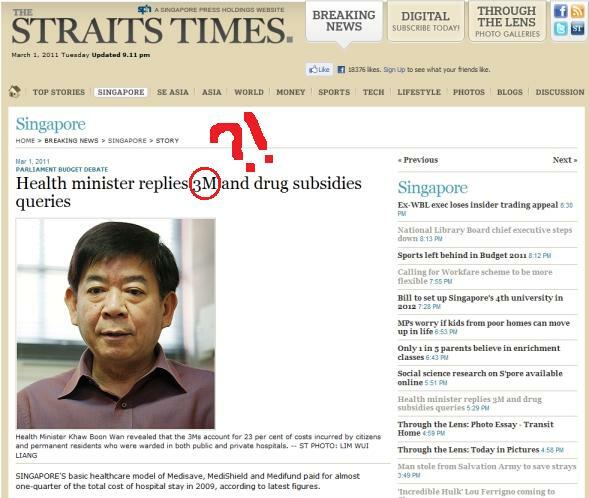 NAIMA BLOG: 3M do not object Health Minister using the acronym "3M"
3M do not object Health Minister using the acronym "3M"
Have you read this article titled, "Health minister replies 3M and drug subsidies queries"? No, 3M is not referring to the company of "3M", but to "Medisave, MediShield and Medifund". SINGAPORE'S basic healthcare model of Medisave, MediShield and Medifund paid for almost one-quarter of the total cost of hospital stay in 2009, according to latest figures. Health Minister Khaw Boon Wan gave the figure on Monday saying it referred to costs incurred by citizens and permanent residents warded in both public and private hospitals. The Government picked up 51 per cent of it in the form of subsidies, while employers and patients paid the remaining 27 per cent, he said in a written reply to a parliamentary question from Non-Constituency MP Sylvia Lim. The Health Ministry subsidises 55 drugs for treating cancer, and reviews its list of subsidised drugs regularly. The most recent additions include paclitaxel for breast and ovarian cancer, and oxaliplatin for colorectal cancer, Health Minister Khaw Boon Wan said in a written reply to Non-Constituency MP Sylvia Lim on Monday. Another 17 drugs which are used for supportive or palliative cancer therapy are also subsidised, he added. From Straits Times, "Health minister replies 3M and drug subsidies queries".